Positive Coaching Alliance recommends some practical ways to manage your time. For example, use travel time to and from school, practices and games to read or to complete homework assignments. Take short breaks between tasks to clear your mind so that you can move on to the next task or project and complete it efficiently. Don’t procrastinate. The temptation to do so often means you are dreading a certain project. Diving right in reduces the dread, so that the time you might have spent worrying you now are spending on completing the assignment and eliminating the need for worry. Best of all that clears your mind to focus 100% on your basketball, making it more likely you will excel on the court. All players will get a ball and line up with some space on the baseline. The players will be allowed 4 dribbles to dribble the ball in the figure 8 motion for the allotted amount of time. The first dribble will be to their right side with their right hand. The second dribble will between the legs from the right hand to the left. The third dribble will be with the left hand on the left side of the body. The fifth dribble will be between the legs from the left side between the legs to the right side. Have the players get 2 balls and find an open space on the court facing coach. 1 ball will be on the floor with a hand touching it while maintaining a good stance and dribbling the other ball with eyes and chest up. 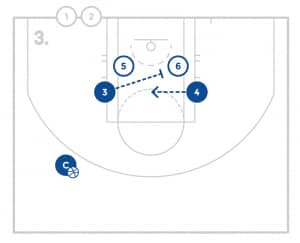 The coach will indicate that when they say a number 1 through 4 that each of those 4 numbers will correlate to moving the ball on the floor a certain direction and then back to the starting point. 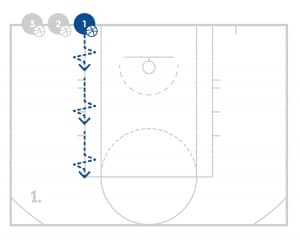 As the players point the ball, coach might say “3!” at which time the players will continue dribbling and also quickly move the ball that is on the ground to the 3 spot and back to the starting spot. This process will continue for the allotted time and with both hands. Have the players get in lines with a couple of balls at the front of each line. The players will dribble in as if they are taking a traditional layup. 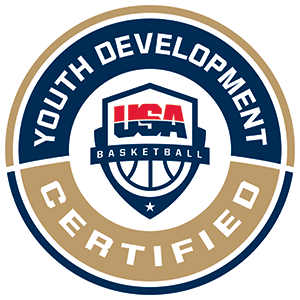 Prior to getting to the basket, the players will imagine a defender cutting in front of them and will take a hard last dribble as they jump and twist their hips to the middle of the floor. Upon landing, the players will quickly jump back up to shoot. Repeat this process for the allotted amount of time and on both sides of the court. Have the players get in groups of 3 at a basket with 2 balls. The two basketballs will be on the blocks and there will be a player responsible for rebounding that ball and putting it back quickly each time. The shooter will quickly go from block to block executing a great drop step and finish. After this player has completed the 4th drop step, the player on the other side will change rolls and begin. This player will complete 5 drop steps and change with the last player who will complete 4 drop steps. The numbers 4-5-4 will help for a quick and smooth transition in the drill. Have the players players start in a line at the top with a couple of balls in the line. Also start with a player on the post and a player on the wing. The player at the top will pass the ball to the player on the wing. The player on the wing will pass the ball to the player on the post and then cut. The post player will pass the ball to the cutter for an open jump shot. After the shot, the shooter will get the rebound and go to the back of the line. The post player will quickly flash out to the wing and receive a pass from the next player at the top. 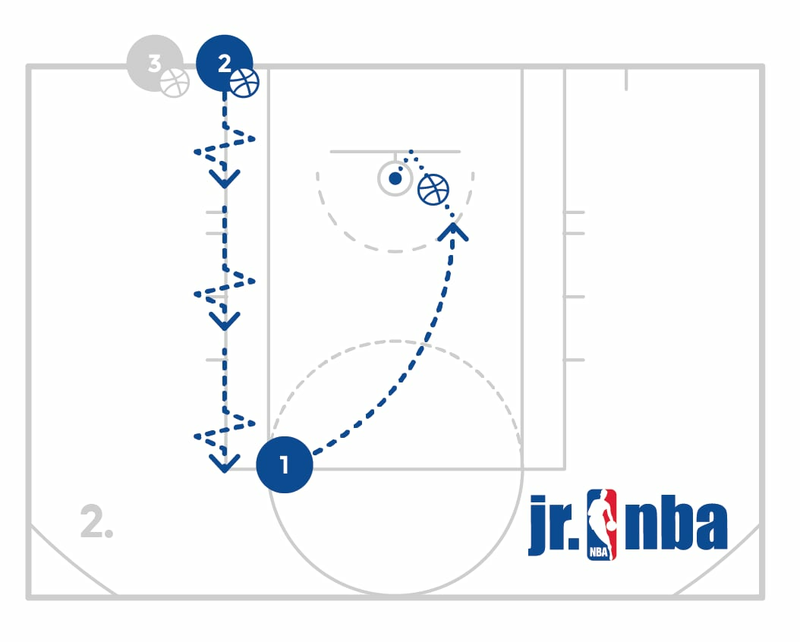 The previous player at the top will sprint to the baseline and then back to the block to post up and receive the pass from the player from the wing. The wing player will pass and cut and the post player will pass the ball back for a shot. This process will continue for the allotted amount of makes.